Jiyoung Park is a multidisciplinary visual artist based in Brooklyn, New York. Summer night (2017) Acrylic on wood, 18 x 24 in. Summer night diptych (2017) Acrylic on wood, 18 x 24 in. Summer night diptych: panel 1 (2017) Acrylic on wood, 18 x 12 in. Summer night diptych: panel 2 (2017) Acrylic on wood, 18 x 12 in. Night View III (2016) Monotype, Flashe, acrylic and graphite, 30 1/2 x 22 3/8 in. Night View II (2016) Monotype, Flashe, acrylic, graphite and ink pen, 30 1/2 x 22 3/8 in. Night View I (2016) Monotype, Flashe and acrylic, 30 1/2 x 14 in. Doublespeak II (2016) Acrylic and Flashe on wood panel framed in brass foil, 20 x 16 x 1 5/8 in. Doublespeak I (2016) Acrylic and Flashe on wood panel framed in brass foil 20 x 16 x 1 5.8 in. Daydreaming II (2016) Collage, graphite, acrylic and Flashe on paper mounted on wood panel framed in brass foil, 18 x 12 in. Untitled (DoJangHaam) (2016) AM paint, graphite, acrylic gesso, ink, flashe, varnish on paper mounted on wood panel, 40 x 30 in. Daydreaming (2015) Monoprint, collage, flashe, acrylic ink, glass beads and glitter, 19 ½ x 13 ¾ in. Composition #125 (2014) Screen print and collage, 16 3/4 x 12 1/2 in. Composition #1124 (2014), Intaglio, collage and wax pencil on paper, Image 15 3/4 x19 3/4 in., sheet 24 x 20 in. Composition #123 (2014) Screen print, collage and flashe, 16 x 12 in. Composition Rose (2014), Screen print, collage and glitter, 20 x 15 in. 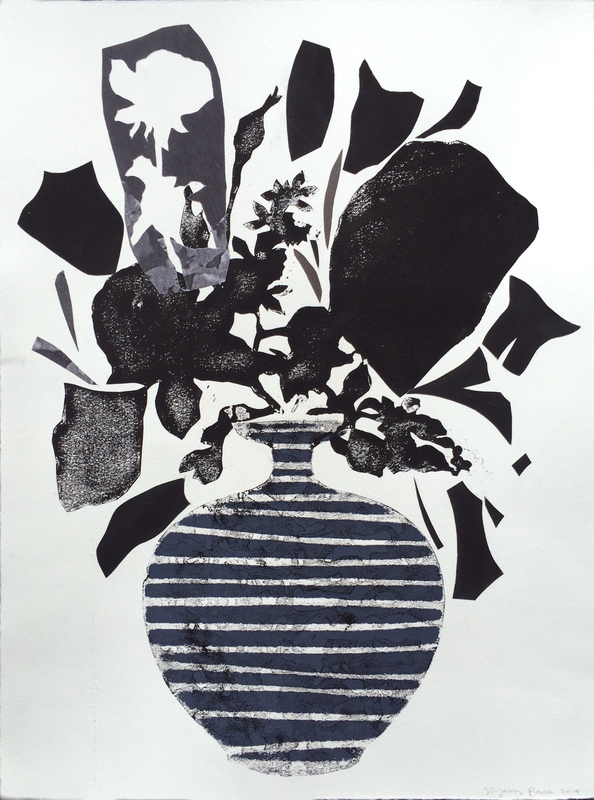 C optik vase (2014), Xerox transfer and acrylic ink, 14 x 11 in. Composition #122 (2014), Screen print, collage, ink and flashe, 13 x 10 in. Arrangement II (2012), Monotype, collage and ink, 30 x 22 in. Arrangement V (2012), Monotype, collage and ink, 30 x 22 in. Arrangement VI (2012), Monotype, collage, ink and color pencil, 30 x 22 in.